Some interesting news from Moonen: The shipyard has been commissioned to complete the construction of a 36.6m semi-displacement motor yacht which was started by Royal Denship before their bankruptcy. 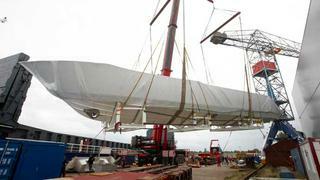 The hull and some parts of the superstructure of this trideck arrived at Moonen in October 2009 (see picture 1 above). Built in GRP with an original design from Bill Dixon, this is a big challenge for the yard which usually works with steel or aluminium. Picture 2 below shows a scale model of the Dixon 105 series, which is very similar in design to the Dixon 120.